The month of June 2017 has seen the proceedings of the Joint Investigation Team (JIT), set up by the Supreme Court of Pakistan, mired in controversy overall while we evaluate these through the lens of civil-military relations. 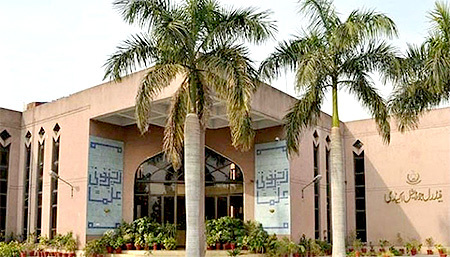 In its rejoinder to the Supreme Court, the Prime Minister House alleged that ‘the reliance and reference to ‘technical analysis’ (by the JIT in its application to the Supreme Court) is an admission by JIT of phone tapping and monitoring of witnesses, a violation of the law and the Constitution.’  This has created the impression of the use of the resources of ISI and the MI in compiling of the report presented to the Supreme Court. Prime Minister’s speech after his appearance before the Joint Investigation Team on June 15, 2017 in which he said that ‘the time of the hidden hand is long gone; now, puppet masters can no longer play their games,’  has also caused apprehensions over possible civil military friction. With COAS personally concluding the negotiations with the agitating crowd leading to the end of the dharna (sit-in) in Parachinar, the concerns grow that the Military seems to be over-extending itself further into areas that neither fall into its professional responsibility nor professional competence. Following the bomb blast in Parachinar on June 23, 2017, the locals started a sit-in, which went on to include a number of demands, among them being a better compensation package for the victims, a visit by the Chief of Army Staff, General Bajwa and Interior Minister Chaudhry Nisar, security of the district handed over to Khurram militia, and the dismissal of FC commander allegedly responsible for firing on the protestors. 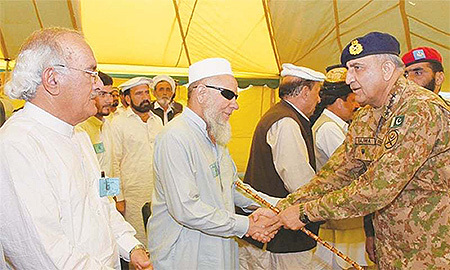 While the COAS announced a whole host of arrangements in Parachinar much beyond security, neither the Prime Minister nor any Federal Minister visited Parachinar – reportedly due to ‘security concerns’ – while the compensation package announced by the PM on June 06, 2017 was already rejected by the protestors. The whole episode raises serious questions over civilian elected Government not fulfilling its responsibilities in an efficient and timely manner. It remains unclear as to what exactly were the security concerns that stopped Governor Khyber Pakhtunkhwa, Federal Ministers and the Prime Minister from visiting Parachinar while the COAS was able to visit the area. Was it a case of civil administration creating a vacuum by its inaction which was eventually filled by the Military? Or was it a case where the agencies responsible for the security of the area advised against visit by the political leadership? 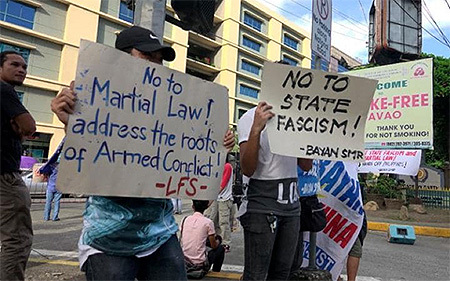 In any case, it is unwise to push the Armed Forces into assuming the responsibilities which are primarily those of the civilian administration. Following accusations from Afghan intelligence agency, the National Directorate of Security (NDS) that blamed Pakistan to be behind deadly blasts in Kabul’s diplomatic quarters in March and April, . 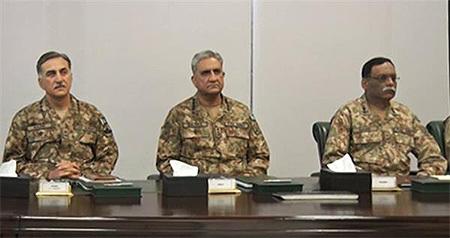 a number of civil-military huddles took place in Pakistan to respond to these accusations. A view is also expressed that the timing of the release of this book may have its own agenda of creating or feeding certain perceptions inimical to the image of the Inter Services Intelligence. 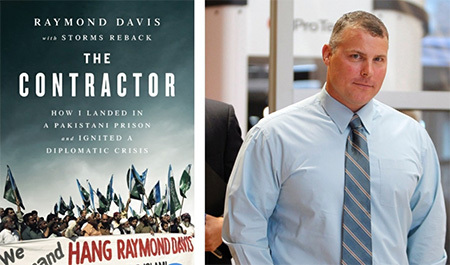 While the narrative in Mr. Davis’ book does not need to be taken at face value, it raises serious questions pertaining to Pakistan’s national security, foreign affairs as well as legal propriety that need to be clarified by those involved in the incident. After all, three Pakistani citizens were killed, with two of them shot dead by Mr. Davis himself. Those allegedly involved have not so far denied claims made in the book. An investigation must be carried out of the whole affair and the results of that investigation made public. This matter involves national security and not just implicates the security apparatus of the country but also the questions the propriety of the trial that led to Mr. Davis’ release. 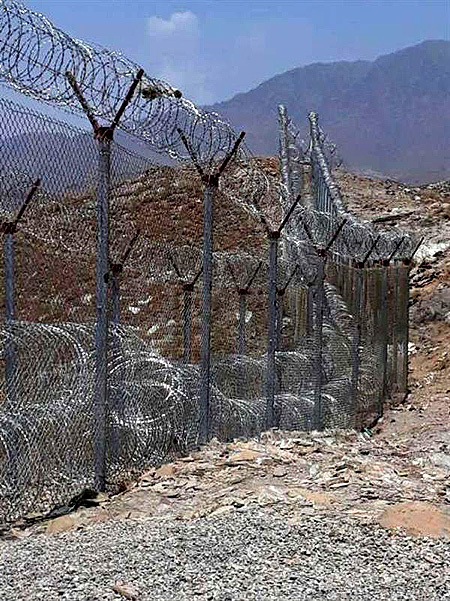 PILDAT has continued to advocate for the pressing need for a better-managed Western border. Our focus stems from the belief that no State can survive with soft borders and unless Pakistan secures its borders, it will continue to face a host of issues branching not only in internal and external complications to security but also matters relating to health and trade, among others. The official public relations body representing the 3 branches of the Pakistan Military, the Inter-Services Public Relations, is often admired for the speed and efficiency with which it puts forward news and perspectives representing the Military. 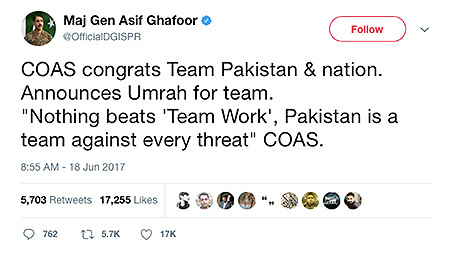 In recent times, it was perhaps at its quickest when within minutes following the win of the Pakistan Cricket Team in the final of the ICC Champions Trophy on June 18, the ISPR issued a tweet congratulating the Pakistan Cricket Team for the win on behalf of the COAS. The tweet, however, did not just extend felicitations to the team. It went on to announce ‘Umrah for the team’ as well, on behalf of the COAS. While the country was indeed feeling jubilant at the trophy win and the cricket team was showered with accolades, it is unclear as to why the COAS should feel the need to extend the offer of Umra for the cricket team. Presumably the offer is extended through using public resources available to the COAS leading one to question whether it is the best utilization of the same in this regard. Given that the offer was made by the COAS to the national cricket team and not a military-affiliated team makes it further confusing. Beyond congratulations, it may have been more appropriate for Pakistan’s elected Government to honour the cricket team even though that has also been challenged in the Court of Law. PILDAT has long maintained that in keeping with international financial and budgetary best practices, Pakistan must put an end to discretionary funds and block allocations in our national and provincial budgets. The need for a more stringent, transparent and efficient use of public resources is a critical requirement for Pakistan. The tweets are peculiar as these touch upon many sensitive national and foreign policy issues that may not make official ISPR twitter account as the best platform. The tweets seem to draw a parallel that Pakistan has diplomatically fought hard to fend-off. To somehow give the impression that the two regions are at all similar is irresponsible to say the least. The official foreign policy perspectives of any nation are carefully prepared and calibrated and therefore require to be officially presented. In matters of such sensitive nature, it is best that only the relevant official channels responsible for sharing Pakistan’s official perspectives are used. The controversy surrounding Gen. (Retd.) Raheel Sharif’s joining as Head of the Islamic Military Coalition to Fight Terrorism has continued unabated. Speaking in the Senate responding to a Calling Attention Notice on June 02, 2017, Advisor to Prime Minister on Foreign Affairs, Mr. Sartaj Aziz, maintained that former Chief of Army Staff, General (Retd.) 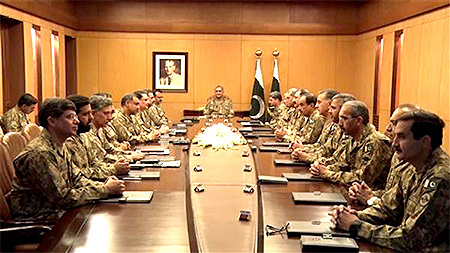 Raheel Sharif’s role as head of the Islamic Military Coalition to Fight Terrorism would not have any bearing on the basic position or foreign policy of Pakistan, the guidelines of which are still based on the April 10, 2015 resolution of the Parliament according to which Pakistan would maintain a balanced position on regional conflicts. Mr. Aziz also told the House that the Terms of Reference of the Islamic Military Alliance are yet to be finalized and would be presented before the Parliament once they are finalized. However, Mr. Aziz acknowledged that the Riyadh Conference of May 2017 had widened the sectarian divide. In a welcome development, the National Security Committee meeting on June 07, 2017 took place within a week of the previous meeting held on May 31, 2017. The NSC was established with a National Security Secretariat to assist its functioning by the PML-N Government in August 2013. 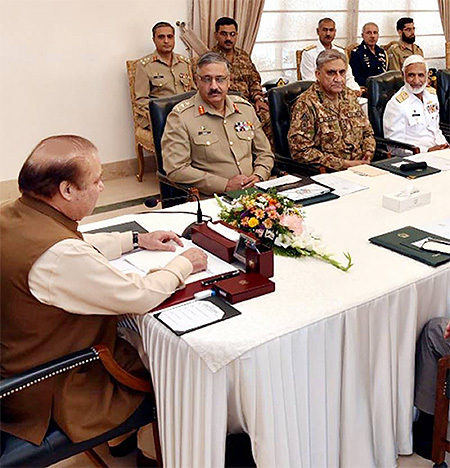 Since its formation, the NSC has met for 8 times since its establishment 3 years and 9 months ago. PILDAT has continued to advocate for monthly, if not weekly, meetings of the NSC, in keeping with international standards of similar bodies. The NSC is not just required to meet as Pakistan has a host of national security issues to deal with. The NSC is also important as it provides a forum for consultation between elected Government and the Security officials. The meeting was attended by the Federal Minister for Defence, Khawaja Muhammad Asif, MNA, who is also a member of the NSC. The Federal Minister of Defence has been conspicuous by his absence in 9 interactions that have taken place between Premier and COAS Gen. Bajwa from December 2016 to June 2017.